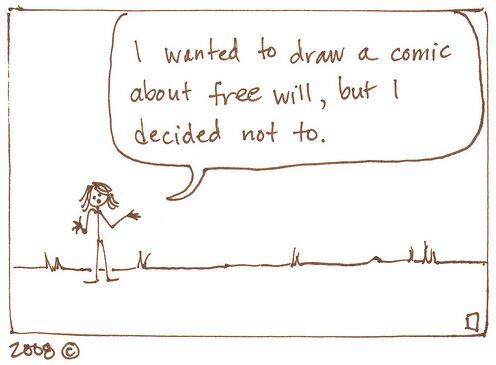 In essence free will is our “I’ll do what I please” compass. The dial will point in one direction of our internal compass, but free will comes along (not only for ourselves but others whom will be involved) to close the compass and change direction on a whim. There is no sense to be made from free will, only that we are AWARE we are utilizing free will choices. Society plays a very big role in free will also, as it creates temptation for self—people, places, things are all a party to choice. Should I, could I, I will are all free will processes, and then society lends it’s two cents and the outcome is typically a free will choice. If you have been in a situation where you have already made up your mind on a direction you are moving and someone or something comes along to create pause, one than feels the pull towards a split decision . . . this is called free will. Even if the decision goes against everything one feels is right and the best course of action, free will choices based on pressure, manipulation, or coercion is no longer a decision made entirely by self but by persuasion and the right to choose free will and change your mind.